Having lost interest, generally, in World of Tanks, I do have to note that this weekend is the 3rd anniversary of the game, with some very good specials, and quintuples available. I did update my client to 9.0 but didn’t play. And I very much enjoyed Karl, the April Fools 8-Bit Tank. Finished a fascinating book about….. chess. Yeah, I said chess. The entertaining book by Paul Hoffman describes his encounters as a chess writer/sportscaster and it inspired me to try out internet chess again. 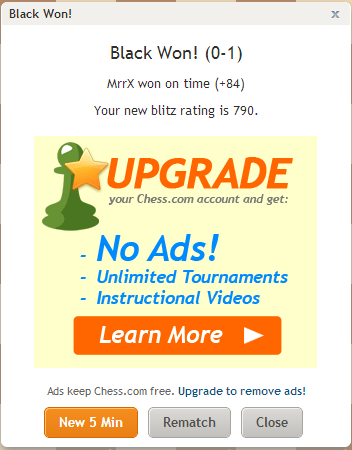 The last time I had looked, things were still pretty clunky – but then again, I doubt I’ve played much online chess at all. I did set up an account on Chess.com and have decided to mess around with Blitz Chess. This is chess with an incredible 5 minute timer per side. There will be no thinking with this format – you simply have to move and make decent moves. The whole idea intrigued me after reading the book, since I realized up in the big leagues the time you take to move actually matters, as opposed to me sitting around a chessboard ruminating forever. So, I’ll find out how well I do as I continue to play a few games. The 5 minute game has another attraction. In the distracted and interruptible world I live in, I can get in games and actually finish them, one way or another. And I did win, at least once ! On time, which is a very new thing for me. Beat him with the clock. Having played only kids for many years I doubt I’m much good any longer, but it’s a fun thing to do if nothing else.